Fresh water Pearls with Gorgeous Luster, Sparking overtones, and excellent value onyx, redagate, and marcasite. 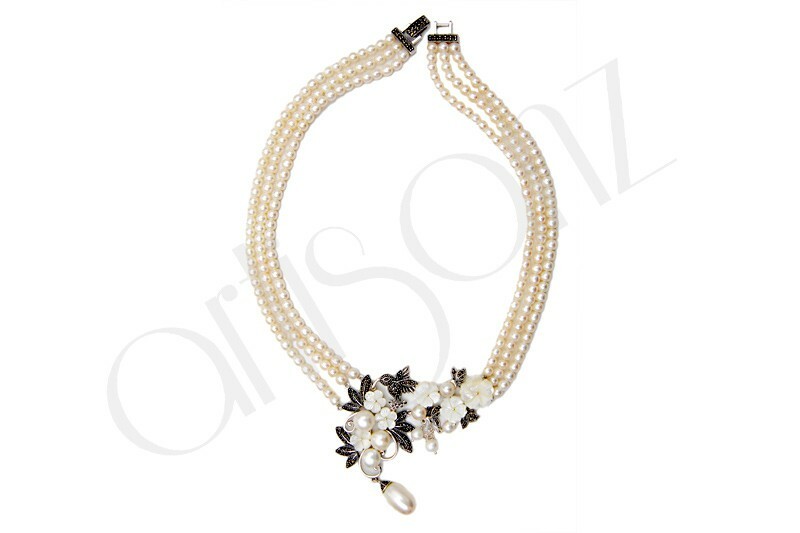 Luxurious Pearl Necklace with pearls as illustrous as the full moon and set in a shimmering array of pastel overtones that complement every complexion, rendering perfection for day or evening wearing. 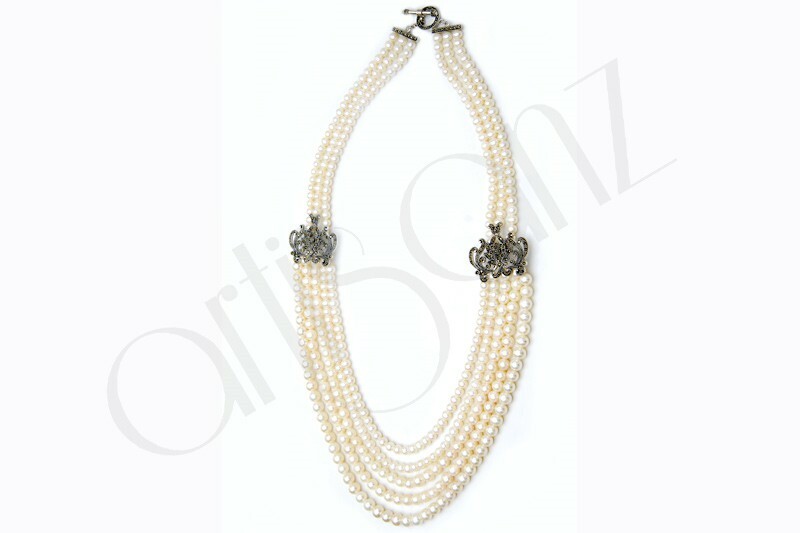 Beautiful Pearl Necklace consisting of all beautiful and extremely lustrous pearls, along with mother of pearl and marcasite setting. 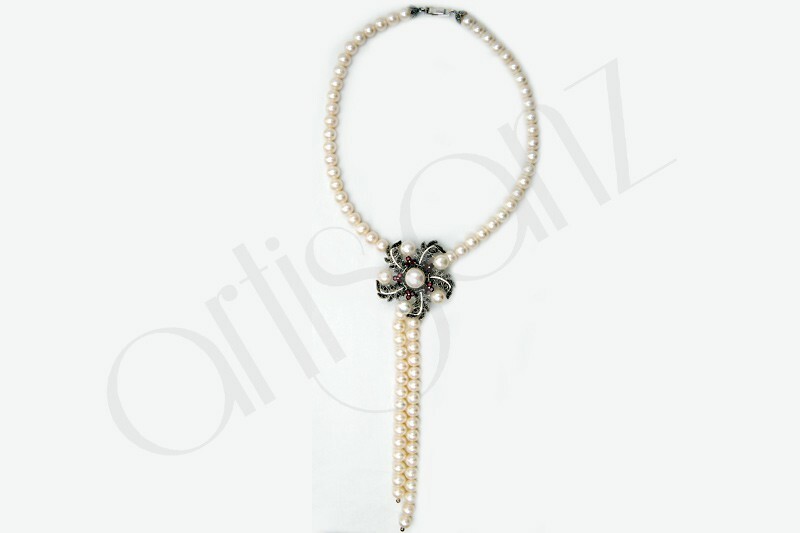 all pearls in the necklace are perfectly round and the attentoin to detail allows it to create a true pearl assemblages. 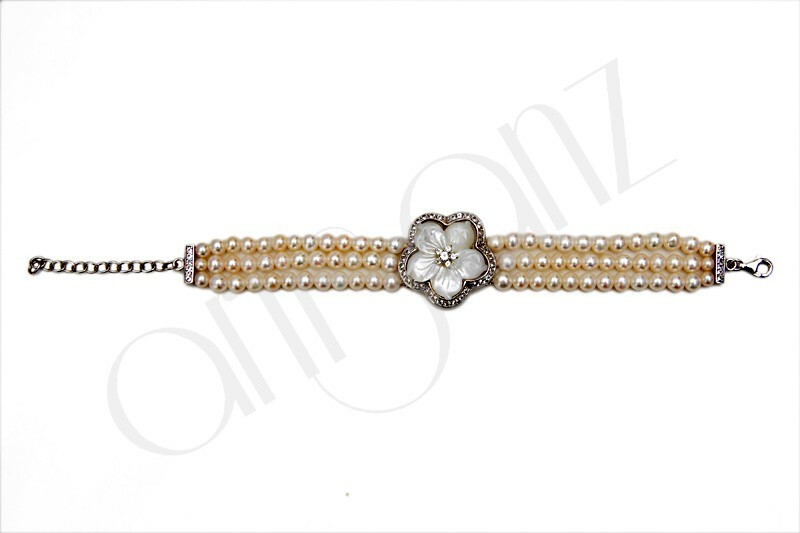 Triple down on style,elegance and charm with our white triple stranded freshwater pearl bracelet.an all times customer's favorite as each freshwater pearl has been chosen for it's superior luster and shine. Gorgeous Midnight Bluish Green colour with black tone and sparking glossy luster are center stage with our signature pearl bracelet. each pearl is individually hand knotted on matching black silk..
Modern and undeniably beautiful pearl and natural gemstones (garnet, citrine, blue topaz, amethyst, peridot and marcasite ) setting. these earrings are practically guaranteed to be an everyday favorite. these modern flower style earrings feature a smooth and high end finish. 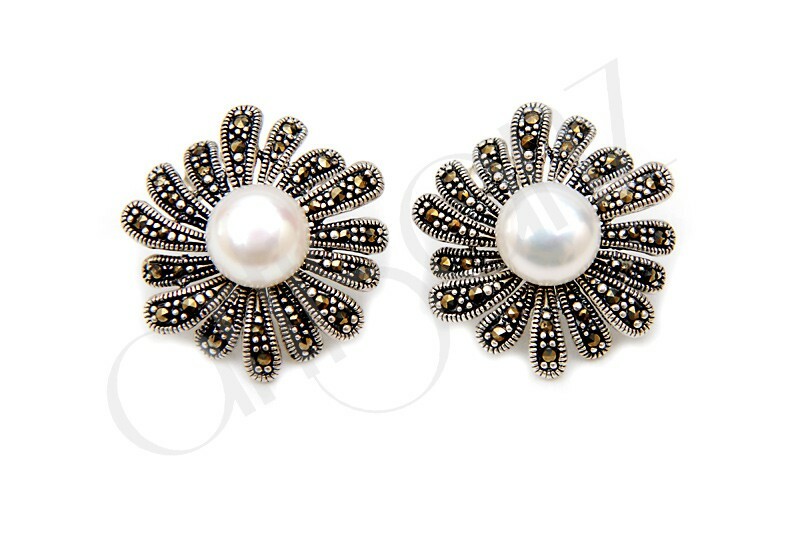 Inspired by the couture fashion these pearl studded earrings with glittering marcasite stone setting feature stunning simplistic design with singular royalty pearl. 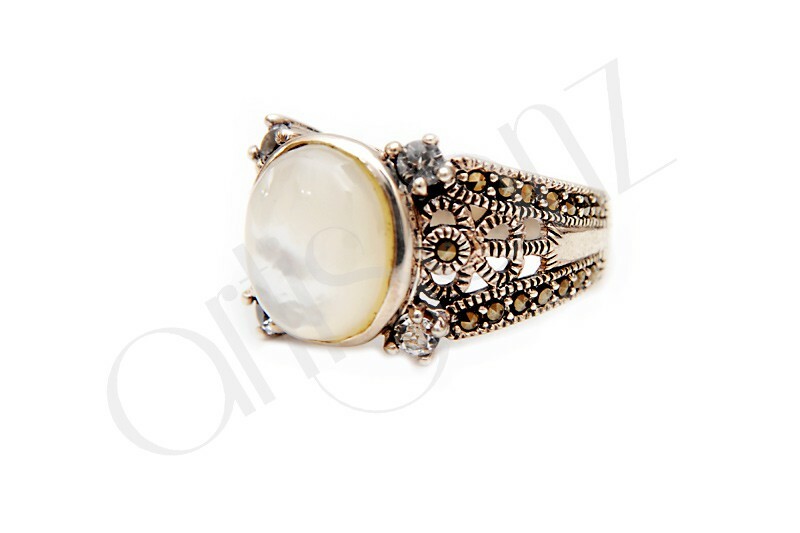 This gorgeous pearl ring is mounted with beautiful marcasite stones. A pearl ring is an elegant accessory any woman would love. Elegant and unique this mother of pearl and marcasite fashion ring accentuated with cornered american diamonds capture the beauty and mystery of deep sea reminiscent of pearl shell and pristine water. this striking ring will delight the woman of exceptional taste and liking.